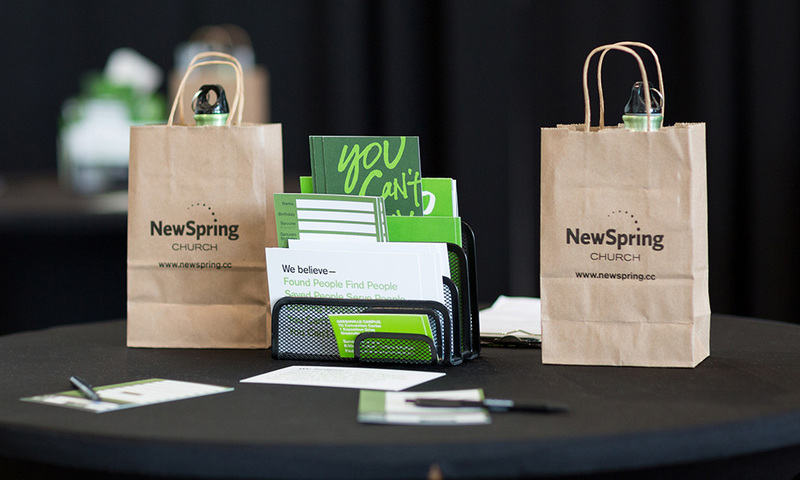 Established in 2000, NewSpring Church is a Baptist Christian “megachurch” — a moniker assigned to churches with at least 2,000 people in average weekend attendance — with ten locations in South Carolina and 27,000 people attending each weekend. (The average NBA arena holds 20,000 people). The church offers various services beyond the weekly service, including groups for kids and teenagers, missions, baptisms (more than 6,500 last year), and a 2-year college education. 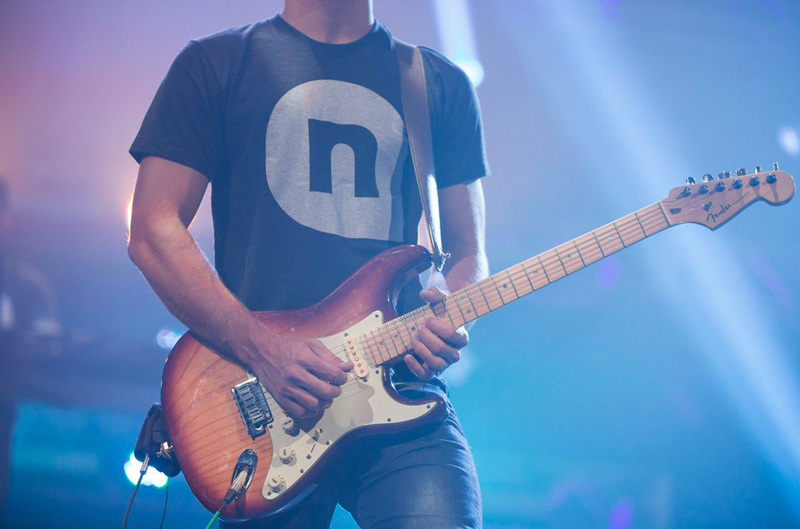 NewSpring Church is not your parents’ church by any means: football-arena-sized screens project the service, led most notably by jeans-wearing senior pastor (and founder) Perry Noble, and punctuated by festival-quality musical acts. 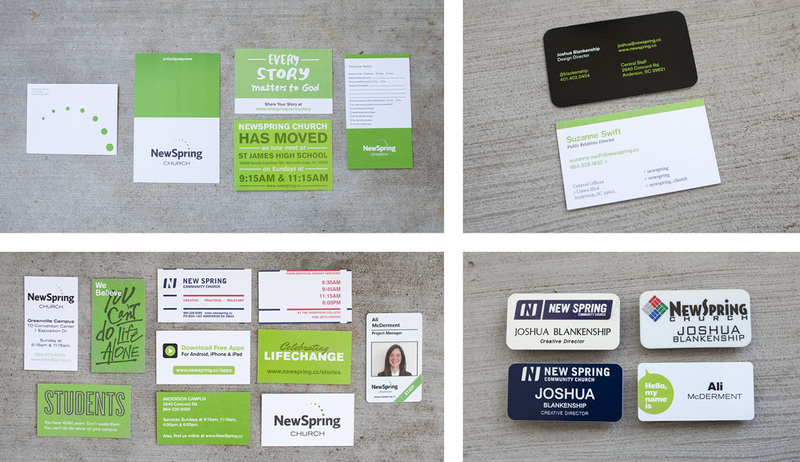 This month, NewSpring introduced a new identity designed by its in-house creative team. I will say this upfront: please be respectful in the comments. Religion-related topics, even about logos, tend to bring out the nastiest in those that don’t share the same views. So, please, chill. Samples of old print materials. Sample of old identity use. Sample of old entrance sign. The previous logo was not terrible. It wasn’t original or anything either. 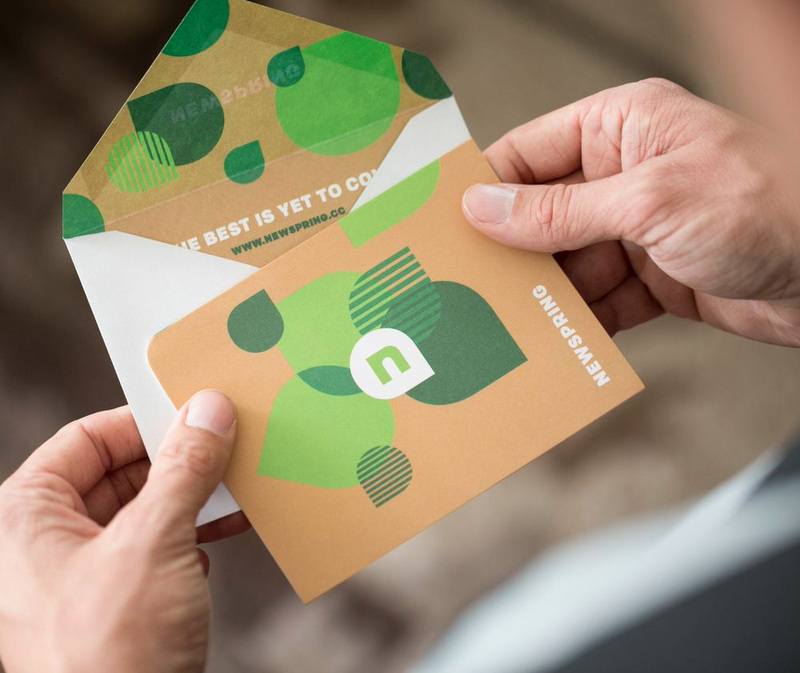 Given what they had to work with, the creative team had done a good job in creating an engaging system revolving around the bright green color, some splashes of handwritten typography, and overall proper execution. “n” shown over the Empty Tomb (of Jesus). The new logo isn’t that original either. We’ve all seen the teardrop shape a hundred and twelve times — and that’s on one Sunday alone. However, it’s not something you see on a church everyday and in this context, it’s a remarkably novel approach. The lowercase “n” is meant to convey the entrance to Jesus’ Empty Tomb in Jerusalem. It’s a great concept to tell but, yeah, it’s a stretch. And I don’t mean that in a jerk way, you could pretty much put any letter over that shape and make it somehow fit. (Okay, perhaps not any of the V, W, X, Y, and Zs). What I do like about the “n” is that it counters the holding teardrop shape with a sharp corner of its own. It’s a small detail but it helps sell the monogram (to me at least). Another element that makes the logo (and identity) work is the choice of Process Type Foundry’s Colfax type family which, as PTF rightfully (and much better than me) describes, is a “refined oval sans serif of 20th century origins and 21st century sensibilities”. 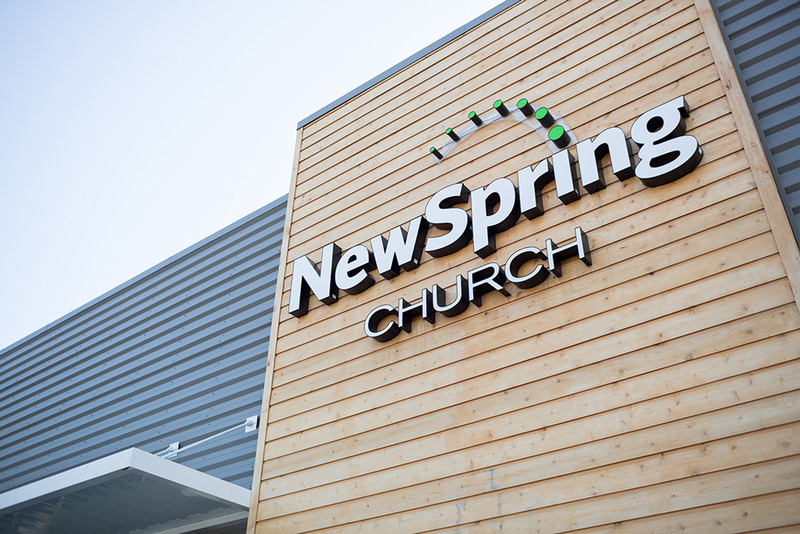 It’s a beautifully crafted, strong sans serif that has a very peculiar aesthetic that gives all of NewSpring’s materials a solid, confident visual language. I am not a fan of the teardrop shape by any standard but of all the attempts at adopting it as an identity element — beyond Duffy & Partners’ Bahamas identity — this is one of the most convincing and successful executions. I really like the placement of the “n” monogram on the lower right corner, taking advantage of the holding shape. (A nightmare for printers, though!). 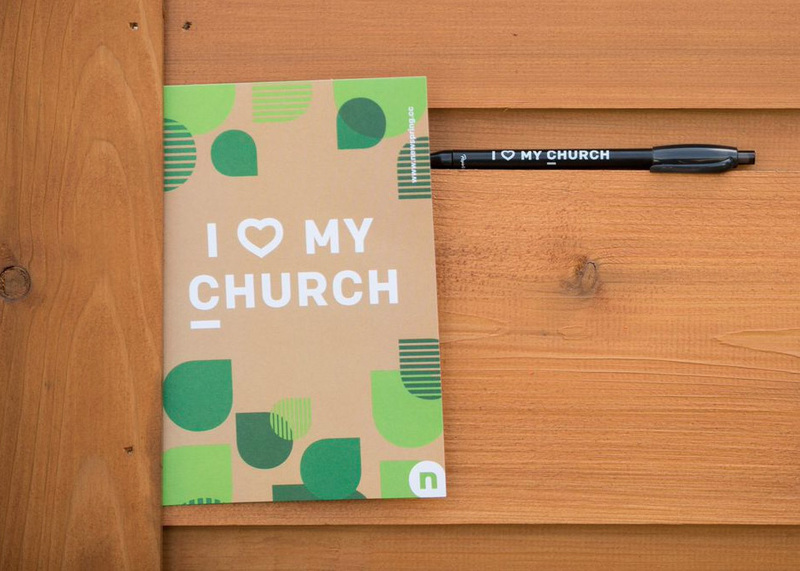 I have been fascinated by the efforts churches make to appear more accessible, younger, hipper, more consume-able, and I think NewSpring and its creative team have found that balance between trying to be cool and actually being cool. Case in point: check their annual report — this is on par with other online annual reports from companies like Kickstarter or MailChimp. 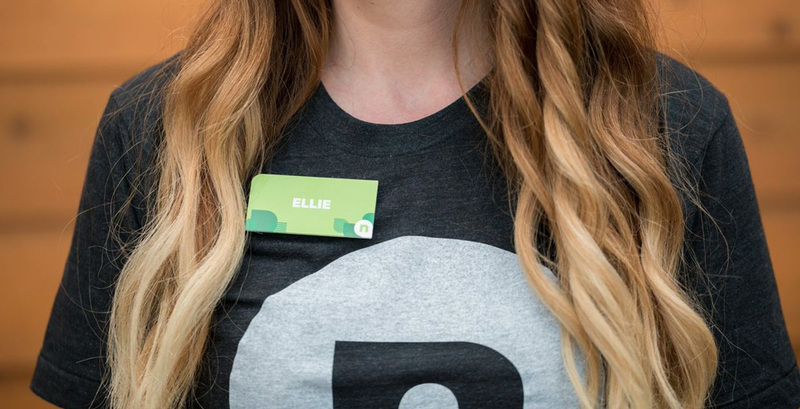 Overall, there is a tremendous amount of work that has gone into this identity and its deployment to the tens of thousands of people who interact with it, and it’s a great example of an in-house team’s positive impact. 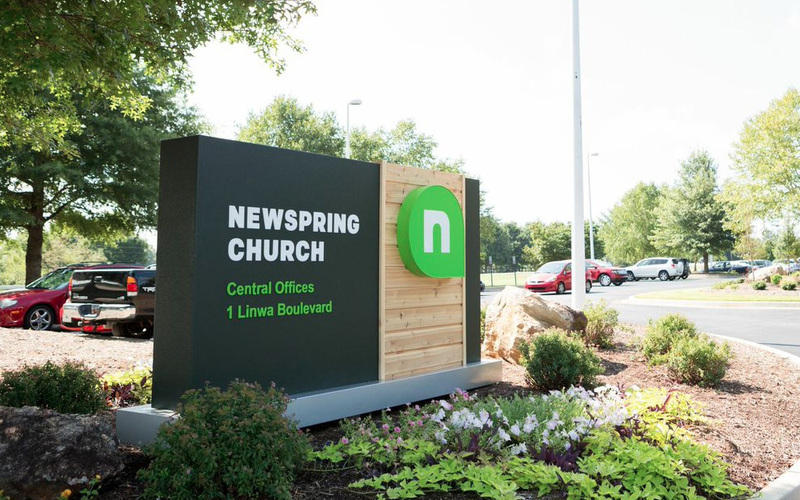 Established in 2000, NewSpring Church is a Baptist Christian \"megachurch\" — a moniker assigned to churches with at least 2,000 people in average weekend attendance — with ten locations in South Carolina and 27,000 people attending each weekend. (The average NBA arena holds 20,000 people). The church offers various services beyond the weekly service, including groups for kids and teenagers, missions, baptisms (more than 6,500 last year), and a 2-year college education. 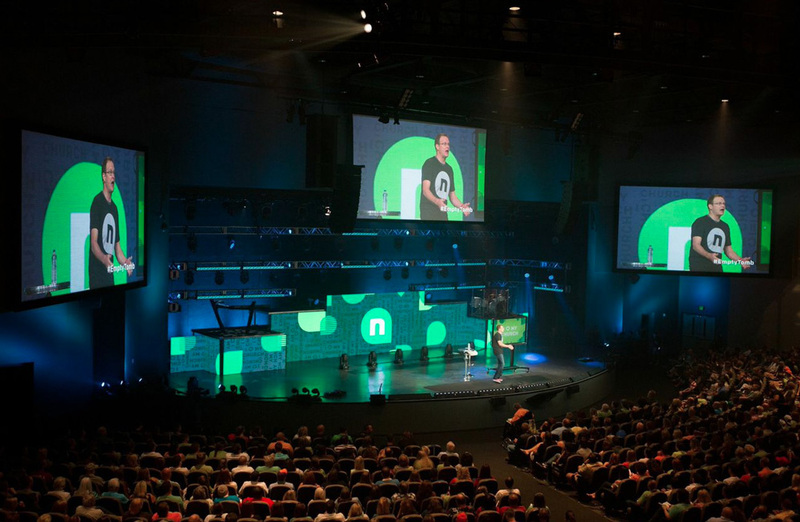 NewSpring Church is not your parents' church by any means: football-arena-sized screens project the service, led most notably by jeans-wearing senior pastor (and founder) Perry Noble, and punctuated by festival-quality musical acts. 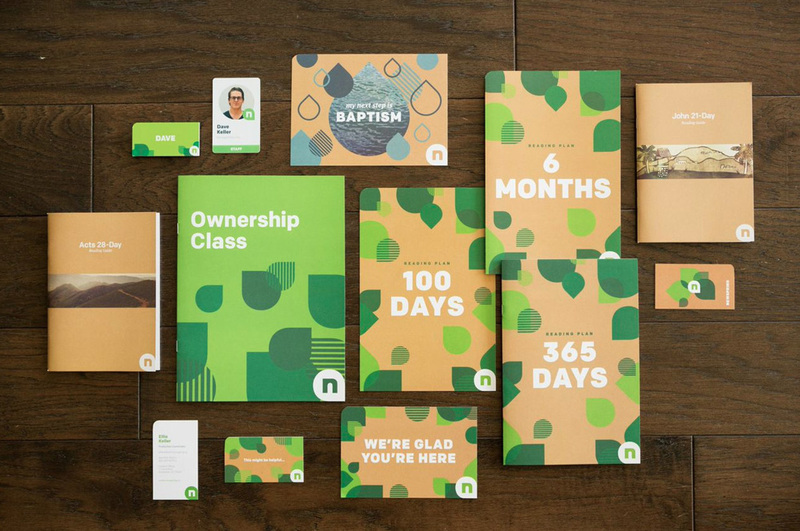 This month, NewSpring introduced a new identity designed by its in-house creative team.